Image: Boom Studios. Cover art by Taj Tenfold. Novelist Saladin Ahmed is currently behind one of Marvel’s most intriguing comics, the vivid and beautiful Black Bolt solo with Christian James Ward. But his next project sounds just as exciting: an original series for Boom that promises some good old-fashioned supernatural crime. 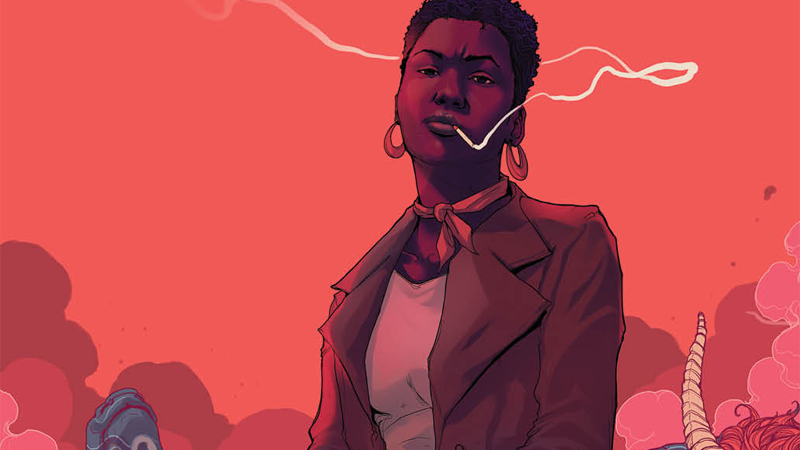 Announced by Boom today, Abbott—penned by Ahmed (who, full disclosure, has previously written for Gizmodo and io9) and with art from Beautiful Canvas’ Sami Kivelä—follows the investigations of journalist Elena Abbott, as she seeks out crimes the Detroit Police department have given up on solving... mostly because Elena knows they’re crimes caused by the dark magic and supernatural forces that claimed her husband’s life. Supernatural crime solving isn’t exactly freshly-trod ground in comics, but Ahmed’s work on Black Bolt this year is one of the most surprising new books out at Marvel right now. His first example of dipping his toes into the world of comics writing has us incredibly excited to see where Elena’s story goes. Abbott #1 is set to hit shelves in January 2018.